The nation's history has sported Clifford names in war, politics and religion and our tour guides relate tales of Clifford Castles, 'Black Clifford', Clifford of the CABAL, a Secret Treaty, a King's Mistress, a Cardinal's daughter; tales of espionage, intrigue, bravery and disaster. From earliest times Ugbrooke was Church land and the House once occupied by the Precentor to the Bishop of Exeter. In Tudor times a manor in the form of the letter E had been built around the earliest house on the site. 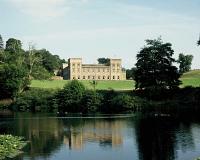 The present house was remodelled in the 1760's by Robert Adam. The Chapel and Library Wing are authentic and characteristic of Adam's castle style. The House contains fine furniture, paintings, beautiful needlework, porcelain and an extremely rare family military collection. Ugbrooke has appeared in films and television programmes including David Starkey's 'Monarchy'. The house as been beautifully restored by Lady Clifford and has featured in many leading Interiors Magazines. Ugbrooke Park, a good example of the work of Capability Brown, set in a romantic Devon combe with glimpses of the Devon landscape and distant views of Dartmoor is unique amongst Brown landscapes. The parkland today still contains many fine mature trees, including Spanish chestnut, Turkey oak and Holm oak. Since the storms of January 1990, the present Lord Clifford has implemented a programme of replanting parkland trees in groups and belts in accordance with Brown's design. The gardens include a box parterre planted over two hundred years ago, a secluded Spanish garden, unusual semi-tropical trees and shrubs, a Lakeside Walk to the Watersplash. The 18th century Orangery is the venue for tea when the House is open to the public and is a perfect place to relax and enjoy the garden. The Chapel was designed and executed in 1760 to Robert Adam's Design. The Italianate Lady Chapel was added by the 8th Lord Clifford in Victorian times. Mass has been continuously said here since 1673 and the Chapel is claimed to be the oldest Catholic Parish Church in the south west of England. Just off the A380 Exeter to Torbay road. Follow the historic house signs.